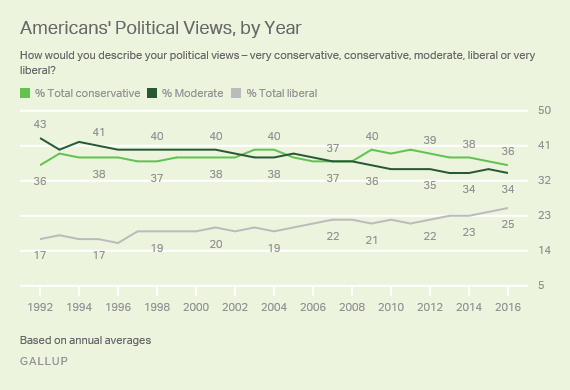 Gallup released a poll this week updating a dataset it began tracking in 1992: How do Americans identify themselves politically—conservative, liberal, or moderate? The data provide some surprises for people of all ideologies, as shown in the following chart. The top-line numbers are pretty simple: 36 percent self-identify as conservative, 34 percent as moderate, and 25 percent as liberal. The interesting facts emerge when long-term changes are observed and analyzed. Conservatives remain constant over the 24-year period, never wavering below 36 percent or over 41 percent. However, moderates have dropped from a plurality of 43 percent in 1992 to a narrow second place in 2016 at 34 percent. Meanwhile, liberals have increased from 17 percent in 1992 to 25 percent in 2016, meaning that there are 50 percent more self-identified liberals now than there were a quarter-century ago, even though they still comprise the smallest cohort in the study. What happened? Gallup reports that all subgroups that identify with the Democratic Party “have warmed to the liberal label since 2001.” About 44 percent of all Democrats now call themselves liberal. There has been a corresponding decline in Democrats self-identifying as either moderate (6-point decline) or conservative (8-point decline) since 2001. Much of the increase in liberal self-identification has been due to changes in the percentage of white Democrats, which increased from 32 percent in 2001 to 50 percent in 2016. This compares to 36 percent of Hispanic and nonwhite Democrats who currently self-identify as liberal, up from 27 percent in 2001.